CES 2014 is well underway and we might have just seen one of the most significant technological leaps forward not only at the show, but for a while. Intel have just shown off a computer the size of an SD card called Edison, which could very well power wearable computing. 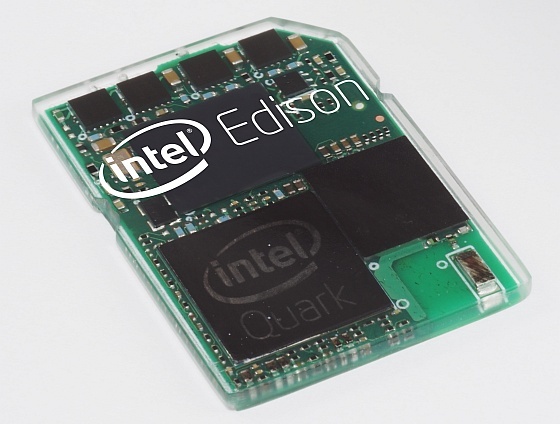 We heard Intel were exploring the options of becoming competitive again and they would use CES 2014 to kickstart their new Quark program, and it seems Edison is the beginning. The new Intel micro-computer is powered by a dual-core Quark SOC processor, runs Linux, and has built-in WiFi and Bluetooth compatibility. It also comes with a special App Store designed specifically for Edison, which Intel says comes with a special version of Wolfram that is baked right in. As with any show, an announcement wouldn’t be complete without a demonstration and Intel chose to demonstrate Edison with a concept for a Nursery 2.0. In the concept, a baby was wearing a Mimo onesie which was packed with sensors tracking things like temperature, and Edison was being used to display the information on a coffee mug. Blinking lights on the mug would show a happy green smiling face when the baby was comfortable, and then a red face when the sensors picked up something distressing the baby. This real world application can be applied two-fold, triggering events depending on remote sensors, right from warming a baby bottle up when excessive movement is detected, right to triggering music at a specific time of the night, or changing the room temperature based on the baby’s core temperature. The sheer size of Edison is what is impressive. The tiny PC is built on 22nm transistor technology and given it’s the size of an SD card, can be mounted anywhere. This may just be the beginning of wearable technology. The key point will be the pricing; if Intel can hit a price point similar to what we see with the Raspberry Pi pricing, then it means this little PC will be in the hands of the masses, and the possibilities theoretically are endless.